Athens, Ga. – Nearly 400 University of Georgia students will present original research projects in fields ranging from history to engineering and health at the upcoming Center for Undergraduate Research Opportunities Symposium. The event, which includes oral presentations and poster sessions, is scheduled for March 30-31 at the Classic Center in Athens. It is open free to the public. The annual CURO Symposium was created in 1999 to highlight undergraduate student research achievements in all disciplines. Participation in the program has increased by 50 percent in the past year to a record-setting 388 students. CURO is administered by the Honors Program but expanded to become available to all undergraduates in 2010. In fall 2014, the CURO Research Assistantship, which provides $1,000 stipends to 250 undergraduates, was launched as part of a series of academic enhancements announced by President Jere W. Morehead and Senior Vice President for Academic Affairs and Provost Pamela Whitten. CURO has offered $3,000 summer fellowship grants for nearly a decade. • A study on “Internalized racism, linguistic discrimination and the policing of ethnic identity on Twitter” by fourth-year linguistics student Minh Nguyen. • Research on proteins linked to diseases such as cancer, congenital muscular dystrophy and HIV/AIDS, conducted by Danish Singh, a biochemistry and economics double major who worked as a 2014 CURO Summer Fellow. • An exploration of “The Impact of Monsoon Severity on Southeast Asian Bond Markets,” by third-year economics major Carson Aft. 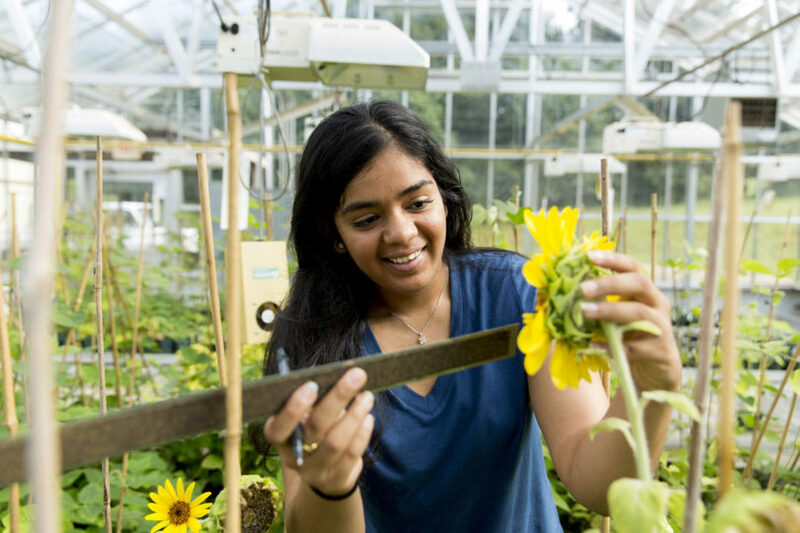 • Research on floral trait evolution of wild sunflowers, conducted by fourth-year microbiology major Hiral Patel. The 2015 CURO Symposium, which is also sponsored by the Office of the President, the Office of the Senior Vice President for Academic Affairs and Provost, the Office of the Vice President for Research, the Office of the Vice President for Instruction and the UGA Alumni Association, will begin at 11:15 a.m. March 30 with four concurrent oral sessions. Sonia Altizer, UGA Athletic Association Professor of Ecology in the Odum School of Ecology and recipient of the Presidential Early Career Award in Science and ­Engineering from the White House, will give the keynote address at 3:30 p.m. on March 30, and awards for best paper, research and mentoring will be presented. A poster session and reception will follow from 4:30-6:30 p.m. On March 31, students will participate in five concurrent oral sessions from 9:30 a.m. to 4:45 p.m.